Party With the Pirates of the Caribbean! Description: Avast Matey! 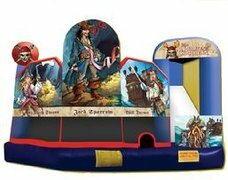 Even Davey Jones himself would have a great time in this pirate themed inflatable 5-n-1 bounce house and slide! Featuring areas to bounce, crawl, and a slide, you may need a treasure map just to find your way out! The Pirates of the Caribbean bounce house and slide is the perfect addition to any pirate themed party or event.